A True Story of Hurricane Katrina, Friendship, and Survival. 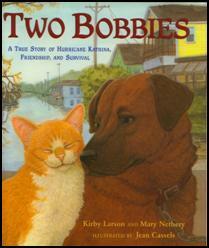 “Both Bobbi the dog nor Bob Cat has a tail, and some say that’s what brought them together.” Abandoned during the Katrina evacuations, pets Bobbi and Bob Cat wander dangerous, debris-strewn streets seeking food and water. Eventually taken to a rescue shelter, the Bobbies show distress when separated but remain calm when together. Workers then discover that Bob Cat is blind and that Bobbi seems to serve as his seeing-eye dog. A national news appearance ultimately results in the animals' shared adoption in a happy new home. The descriptive, sometimes folksy prose and realistically rendered gouache illustrations accessibly convey the Bobbies’ experiences and mutual devotion. An after word, with a photo of the real-life furry friends, notes the parts of the narrative that are speculative, such as the animals’ preshelter experiences. “Larson and Nethery relate the true story of a dog and a cat, both tailless, that come to be called Bobbi and Bob Cat, respectively. Abandoned in New Orleans after Hurricane Katrina, the inseparable duo wander the devastated city for months before being taken into an animal shelter and then finally to a new home on a ranch in Oregon . The improbability of the pair’s survival is heightened by the astounding discovery that Bob Cat is blind and surely would not have persevered without Bobbi’s protection. While the sometimes gritty realism of Cassels’s illustrations successfully captures the essence of the storm-ravaged yet resilient city, the authors, presumably in an attempt to avoid sensationalism, unfortunately rob this story of much of its inspirational quality through the flat, journalistic language they employ. As it presents a story that deals with the tragedy of the storm yet focuses on hope and triumph, this effort will likely hold much appeal for survivors of natural disasters, particularly Katrina. 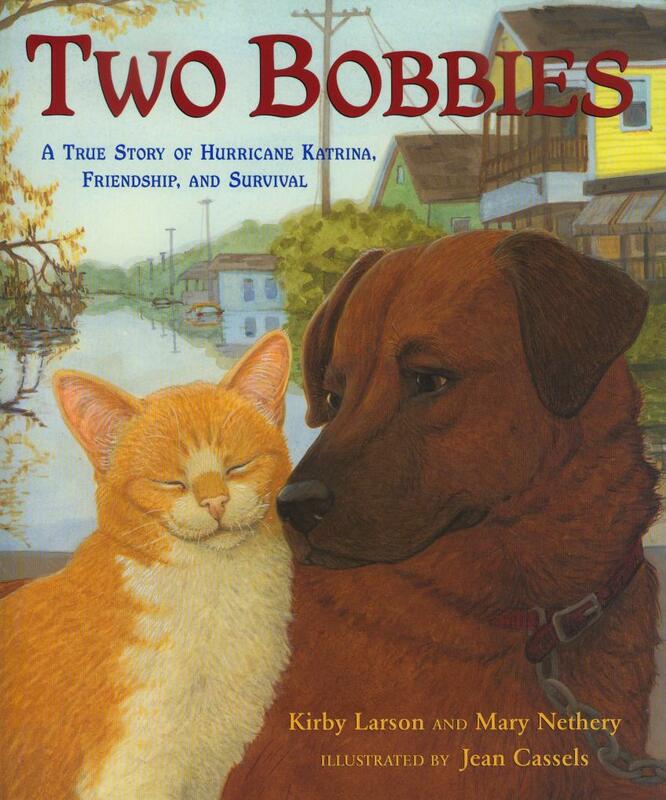 The Missouri Association of School Librarians has selected Two Bobbies: A True Story of Hurricane Katrina, Friendship and Survival (Walker Books for Young Readers), written by Mary Nethery and Kirby Larson and illustrated by Jean Cassels, for its 2010-2011 Show Me Reader Awards List. Congratulations Two Bobbies! This was the book's 10th state nomination. Bronson Children's Book Award Winner! Two Bobbies was also selected for the 2009 Children's Choices list by the International Reading Association and the Children's Book Council, and received a 2009 SIBA. The picture book received enormous press coverage including NPR, along with two Top Ten Picks - from Indie Next (formerly Book Sense) and Bookazine. It was a Junior Library Guild selection and was named among the Notable Social Studies Trade Books for Young People 2009, a cooperative project of the National Council for the Social Studies and the Children's Book Council. "Two Bobbies is one powerful, heartwarming book. But it is the artwork by Jean Cassels that gives the story its emotional power." "...one knockout book for readers of all ages." "Two Bobbies is one [book] you will not soon forget." "Children (and adults) will love this story."